We recently completed a master bathroom remodeling project in Minneapolis that we believe any family could make great use of. 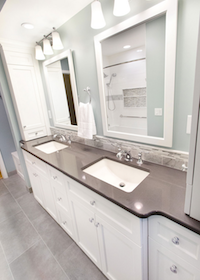 This master bath included numerous storage and utility features that only come through the design of custom cabinets. 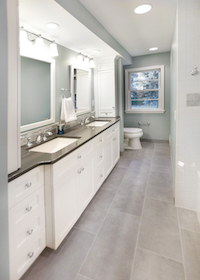 Here are some highlighted features that you could put to use in your next master bathroom renovation. 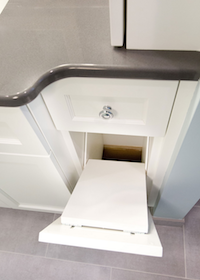 With separate sinks comes the opportunity to also build in separate vanities for individual storage needs. 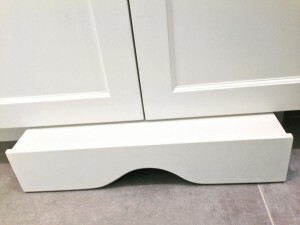 These vanities also provide easy access to products you use on a daily basis. While we all would like to believe our master bathrooms are just for us adults, that never ends up being the case. 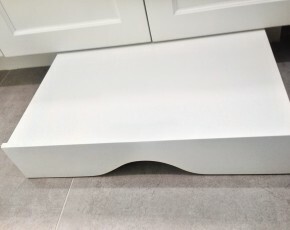 So why not plan for your children’s inclusion by having us design a hidden stepstool that they can pull out when using your bathroom? Mornings are tough. With a custom-built seating area, you now have a place to relax while you ease your way into your day. 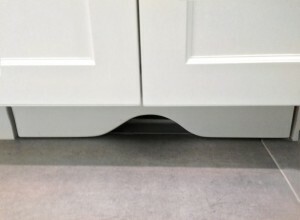 A couple of our favorite aspects of this latest renovation included some features you do not often see in bathrooms. 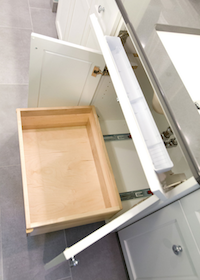 First, pull-out shelves in the lower cabinets make for easier access. 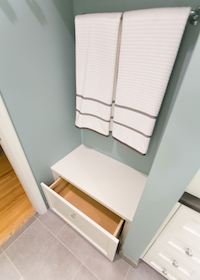 And second, we upgraded the old-school laundry chute by building it right into the vanity. 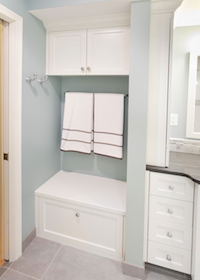 Whether you want a special place for your kids’ bathroom toys or a proper home for your hair dryer, curling iron, electric razor and related appliances, this bathroom has ample storage. 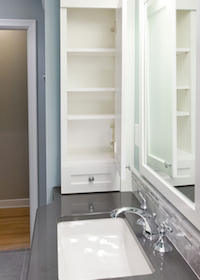 With the right cabinet setup, you truly can have a place for everything in your master bath. Ready to Make Your Master Bath Shine? Call Us! 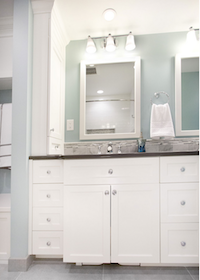 Let us help you create your dream master bathroom. 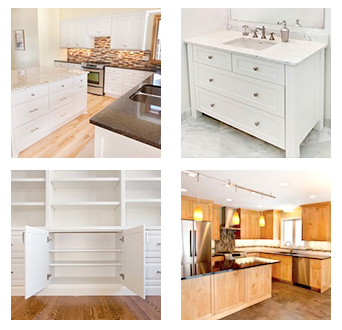 Call us today at 952-737-7088 or contact our home remodeling company online. We look forward to hearing from you! 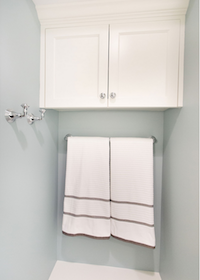 Have Other Favorite Bathroom Storage Features? Does this master bathroom have everything you could ever dream of? Or are there additional vanity or cabinet features you prefer? Share your comments with us here!